.925 Silver and 18 k Pink Gold. The photo does not clearly depict the 18 k Pink Gold,as it looks like Yellow Gold. 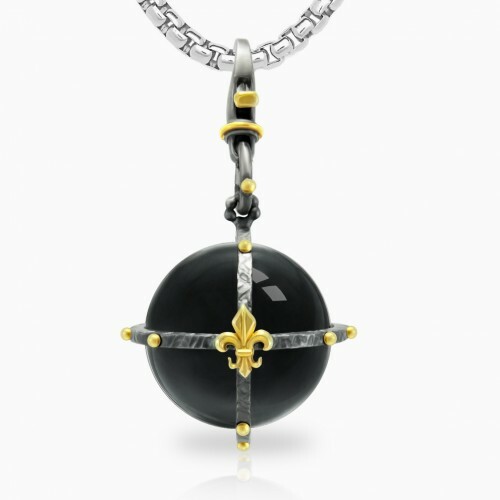 Black Onyx sphere caged in antique blackened silver with a hammered finish and pink gold fleur de lis and accents. Total diameter is 29 mm. 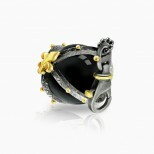 The pendant's top is a lobster claw giving you the freedom to attach and detach this pendant to any chain or cord. 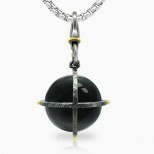 Listing is just for this pendant, chain is not included.